Monty Pythons Spamalot transports us back to England in 932 AD as we join King Arthur and his knights on their quest to find the Holy Grail. If you’re unfamiliar with Monty Python it was a British comedy that spawned over four series, Broadway musicals, plus several films – including the 1975 hit movie ‘Monty Python and the Holy Grail’ which this slot is based on. Playtech have perfectly captured the humour of Monty Python with John Cleese and other cast members included for narration, plus the original upbeat theme tune and sound effects that made it a household classic. On top of this the historical design is spot on lending itself to the fun and quirky nature of Monty Python, and with a free spins mode that offers four additional bonus games (which vary from dodging cows to hunting down a killer rabbit), plus two progressive jackpots (including the life changing Holy Grail jackpot) - there is ample opportunity for you to land the ‘holy grail’ of online slot wins! No Monty Python slot machine would be authentic without the inclusion of the shows characters, and fortunately Playtech realised this and have included them. I really love the design of the symbols and found they reminded me of the Horrible Histories books due to their style. Along with King Arthur (who is the highest valued standard symbol worth 600 coins for five on one payline) and his golden crown, Sir Lancelot, Sir Robin, and Sir Galahad accompany him along with the glamorous Lady of the Lake. The sparkling Holy Grail is the Wild symbol and substitutes for all symbols apart from the free spins, bonus and jackpot symbols. The other symbols you will see on your screen are the typical table games symbols of Ace to 10, and as always they are the lowest valued of all. Three or more Scatter symbols landing on the reels see you rewarded with ten free spins. As these spins play out you accumulate Holy Grail symbols on the central position, with five of them resulting in you triggering the Holy Grail Bonus game. This sees you navigate through six different levels winning prizes along the way, and survival on the sixth level offers you a chance of the Slightly Less Holy Grail Jackpot and the life changing Holy Grail Jackpot that is often worth over £1 million! In true theatrical fashion, there are four different bonus games on offer in Monty Pythons Spamalot, however while most online slots trigger features randomly these occur in order just like a play would. In order to trigger a bonus game you simply need to land a Bonus symbol on reel one and five during the same spin, and here are the features you will encounter in the order they occur. Storm the Castle: As the Knights storm the castle, the French battle back by launching cows at them. Your task is to choose one of six landing areas and attempt to avoid the cow. Success sees you win coins and select another area until you are crushed by the cow and have your winnings to that point released. None Shall Pass: It’s time to do battle as a Knight is standing in King Arthur’s way. You get to strike the Knight four times with a successful strike earning you a cash prize whereas an unsuccessful strike sees the 5x multiplier decrease by one each time with your cash prizes multiplied by the remaining multiplier at the end. The Knights Who Say Ni: This pick ’em game sees you select a shrubbery at the request if the Knights, and when delivered to them they will offer a cash value. You can take this amount or reject it in hope of the next offer being bigger, however you can only play three rounds so don’t get too greedy! The Killer Rabbit: A killer rabbit is preventing six Knights from crossing a path, therefore you must choose one of five rocks to throw a grenade at in an attempt to kill it. If you choose wrongly the rabbit eats the first Knight and this continues until you defeat it, with a cash prize rewarded for the remaining Knights who cross. 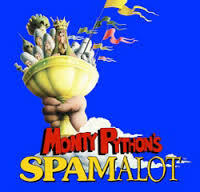 Monty Pythons Spamalot is without doubt one of the best Playtech slot machines. Not only have they captured the humour of the comedy on the reels and used authentic sounds and narration, but the bonus features offered make it sensational. On top of four exciting bonus games the free spins mode offers lots of winning opportunities that culminate with the Holy Grail Jackpot which has changed several people’s lives!